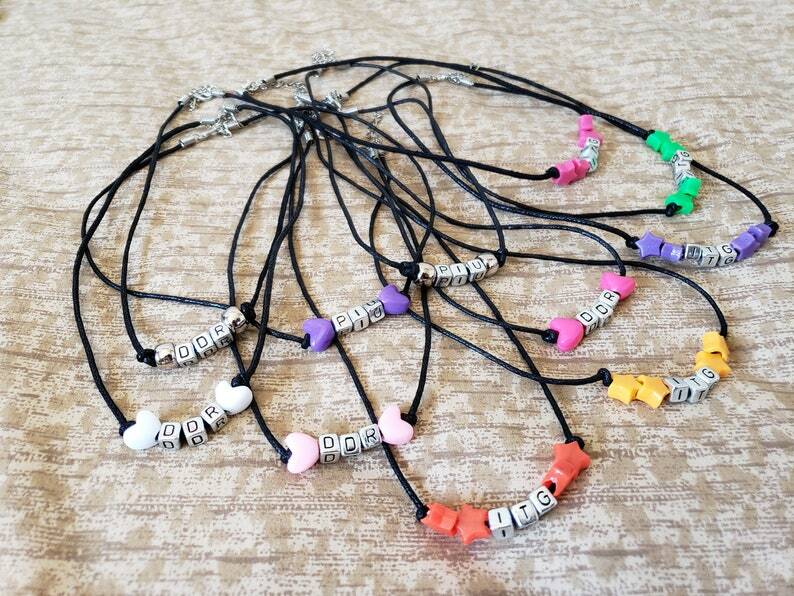 Each necklace is handmade and comes ready to wear on an adjustable black cord necklace. Some color options under the "Side / Accent Beads" selection are not yet pictured but are available for purchase. If you don't see the styles or colors you want there, you're welcome to submit a custom order request (or just send a message)! We have a wide array of pony beads (Google: "pony beads" for explanatory images) in all colors as well as certain other beads available to assist you with customization! This product will be created as a necklace by default but is available as one of several other accessory types upon request. See options below! For any accessory type OTHER THAN the earrings or choker, just leave a note requesting your preference with your order! We charge an additional fee of $3 for earrings and $2 for chokers so please contact us or submit a custom order request for these options! - Lace Choker - Adjustable in length to fit most neck sizes! (Please message if you require a special size.) Made with lace and adjustable chain in the rear.